RICHARD SIMON and TANYA SIMON are a husband-and-wife writing team. Richard is chair of the language department at an independent school and is co-author of a successful off-Broadway play. Tanya is co-author of the children’s novel Zora and Me, winner of a Coretta Scott King/John Steptoe Award for New Talent. They live in Westchester, New York. 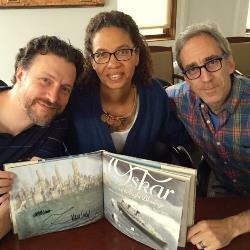 Oskar and the Eight Blessings is their first picture book. MARK SIEGEL has illustrated a number of picture books, including the Texas Bluebonnet winner Seadogs with Lisa Wheeler and the Siebert Honor book To Dance, with his wife, Siena Cherson Siegel. He wrote and illustrated the New York Times bestselling graphic novel Sailor Twain, Or the Mermaid in the Hudson. He lives in New York with his family.